n.i.f.t.y c.r.a.f.t.y: I'm Feline Good with you! Hello There! I'm back again with my fourth and final guest post for this month. 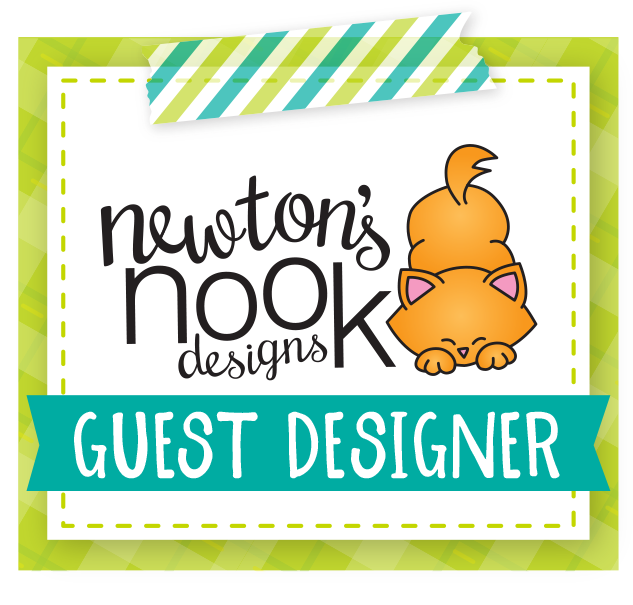 I had a wonderful time being a guest designer for Newton’s Nook! Huge thanks to Jennifer, Samantha and the team of Newton’s Nook Design for giving me this great opportunity. My sincere thanks and love to all your nice comments on my cards. It’s been a great month for me! For today's card, I decided to play with the Newton’s Sweetheart stamps set again. 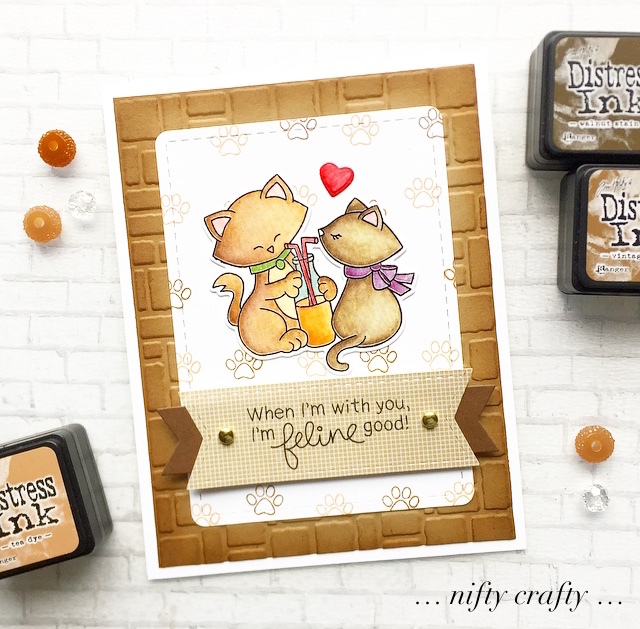 I couldn’t resist playing with these lovey dovey kitty stamps on this set. This time, I picked the stamp where Newton and his sweet girlfriend sharing a bottle of drink. I stamped and colored them using distress inks. For a change, I made them to drink Orange Milkshake 😋. Then, I cut them out using the coordinating die from Newton’s Sweetheart Die Set. To have a monochromatic look , I used Kraft as the main color for my card. I used the Darice brick wall embossing folder to emboss the Kraft card and inked the edges using distress inks. I just love how the bricked texture turned out! Then, I used the stitched rectangle die from Frames & Flag Die Set to create the focal panel. I did a background stamping on it using the little paw stamp from Newton’s Sweetheart stamps set. Next, I used two sentiment banners from Frames & Flag Die Set to create a panel for the sentiment. I stamped the sentiment from Newton’s Sweetheart stamps set on the stitched banner and adhered it on top the plain one and embellished with two gold brad. 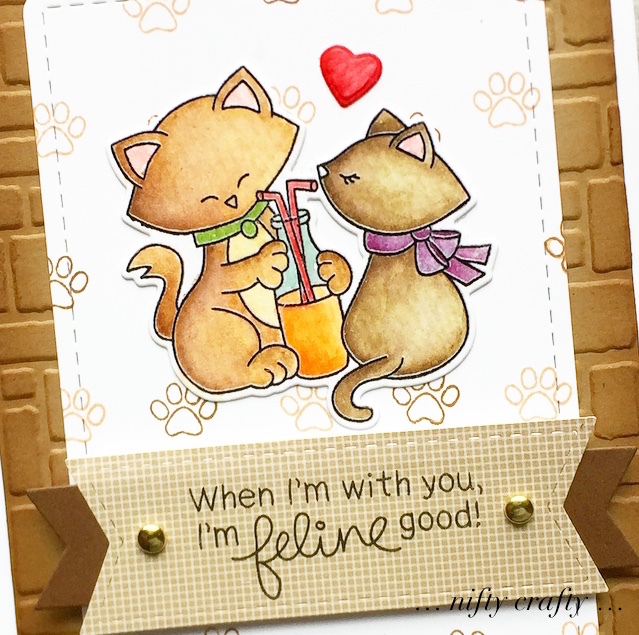 Finished off the card by adding a little red heart on top of the kitties. I hope you’ve enjoyed my take on this card! This is so adorable! Thank you so much for being our guest this month! We really enjoyed all your projects!